A long way. An epic adventure. A common goal. 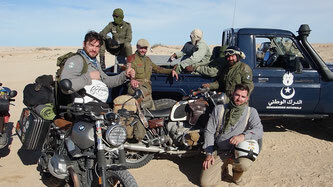 “This is a ride about friendship, adventure, dust and experience, but with an important charitable goal in mind." Hailstorm in the mountains, dust in your eyes and a smile on your face. Would you fancy a break from your normal, everyday life?  Inspired by the truly adventurous journeys of our forefathers, the Motorcircus has again been on the move, learning about new routes, new cultures and poor quality petrol. The compass needle points south and the destination is clear. The Smiling Coast. The three boys, out in the bush, had just finished gathering peanuts. They discovered us taking a break at a watering hole in the Gambia. Five motorbikes and their dusty white riders in the middle of nowhere. Shy, but curious, they sized up the situation. We broke the ice with warm water, ball point pens, and hands stretched for handshakes. Fleeting meetings like this, at the edge of the road, were for us wonderful and important encounters. 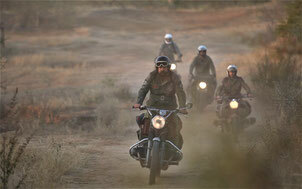 It was certainly true, travelling on two wheels almost guarantees the rider contact with the country and its people. No door stands in the way of the people‘s interest in the whys and the wherefores of your journey. To be exposed to the elements that‘s what we all wanted….even when it could occasionally get a bit uncomfortable. Five guys (Chris, Marko, Ronald, Martin and Thorsten) rode their bikes through the streets of Gibraltar. From the ferry, they could soon make out the continent of Africa. The adventure, MissionSouth, begins right here. Morocco has a warm welcome for us, apart from the weather. The clouds gather above our heads and then the rain comes down. The Ffrst few days we were pursued by this low pressure front. Africa, where is your much vaunted sunshine? On the other hand, the roads were in good repair and every now and again we got a hint of the good weather that was to come. We rode through the mountainous regions of Tetouan and Chefchaouen and looked forward to Volubilis, an important provincial capital of the ancient Romans. Today the ruins and their columns whisper to the archaeologists of what they‘ve seen and Hassan the Berber tells his guests stories of the many excavations amongst the stony remains of ancient creatures. 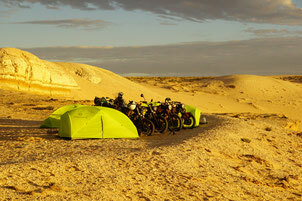 Every morning we‘d rig up our gear onto our bikes and every evening strip it off again. Eventually each man and bike became a solid team. 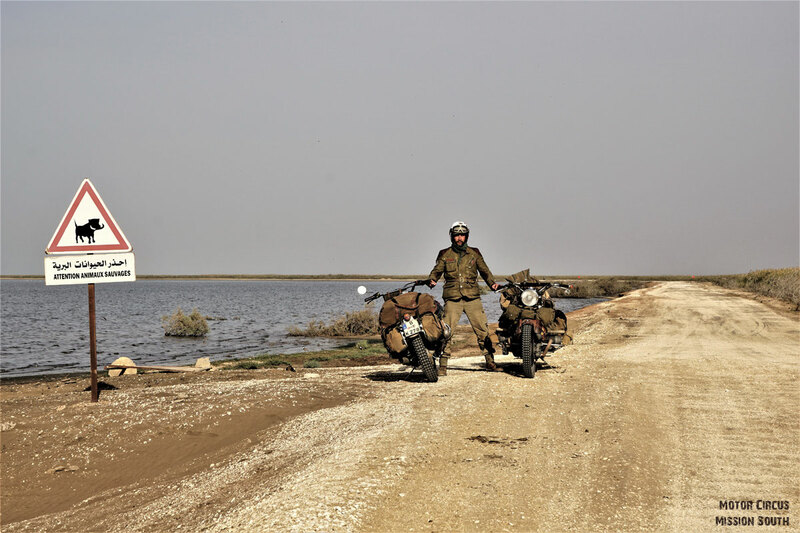 Two trusty bikes from the seventies, two brand new RnineT Scramblers and the tried and tested GS Adventure made up the contrasting team of five BMWs on our adventure. Long trips or short expeditions they all need careful preparation. This trip was no different. Each of the motorbikes had to be individually adapted to carry baggage and equipment and maintained to the best possible standard. Protective covers for the undercarriage and all ventilation valves were essential and the choice of tyres needed to be carefully thought through. Replacement parts and tools had to be sought out and camping equipment needed to be small, light and highly adaptable. To feel closer to the experience our grandfathers might have had, a couple of the guys did without modern specialist clothing, but without courting any unnecessary risks. We still needed to think through our goals for each day. Marko planned the distance to be covered each day exactly to cover the 5,000 kilometres to the Smiling Coast in the time available to us. The first route change had to be made, however, even before we crossed the Atlas mountains. The bad weather front persisted and in those first days travelling more than 250 kms a day was pretty much impossible. This had not been planned. Did we want to continue and see as much of the Atlases as possibe? On the other hand the mist obscuring our view, the rainwater in our boots and temperatures bewtween 2 and 12 degrees suggested maybe there might be a better way. Why should we struggle on against the powers of an unhappy nature when one clever move promised us palm trees and sunshine? We chose the direct pass over the mountain tops and once again the weather punished us with hail and treacherous bends in the road. Our hands grew increasingly stiff from the cold. From the very beginning of this stage we were looking forward to our mulled wine at the end of the day. In the meantime we made do with sugary mint tea and occasional sips from our hip flasks. Ronald wrapped us carefully in blue foil to keep the wind and the rainwater at bay. The high pass was closed because of the bad weather, but, thankfully, only just after we, smiles on our faces, had passed over it. We ended our first day in front of the chimney fire of our mountain inn and laid out our equipment to dry. Polish GS riders came and joined us and we had a boozy, happy evening - without cold feet. The route changes ,we had decided on, meant a longer route but the weather was from now on truly wonderful. Passing through Er-Rachida and Erfoud, we reached, in darkness and sandy winds, Merzouga, near Erg Chebbi. We took up quarters in a Berber castle and felt like Lawrence of Arabia. Each of us slept like a stone, which was the best preparation for our rest day. The day began with sun, bellowing camels in the palm groves and a huge pile of sand. Here, 30 km from the Algerian border, we find one of the largest set of dunes in the Sahara. Up to 150 metre high it sits magnificently in the landscape, fringed by oases. It is crossed by small Touareg caravans showing the tourists the beauty of the bare desert. We saddle up our German camels and get acquainted with the finest of sand. 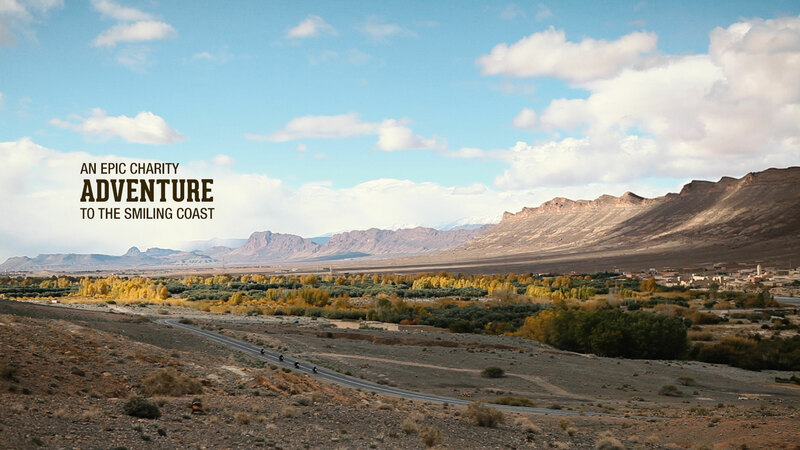 Ali Oubassidi takes us into suitable terrain and the fun could start. 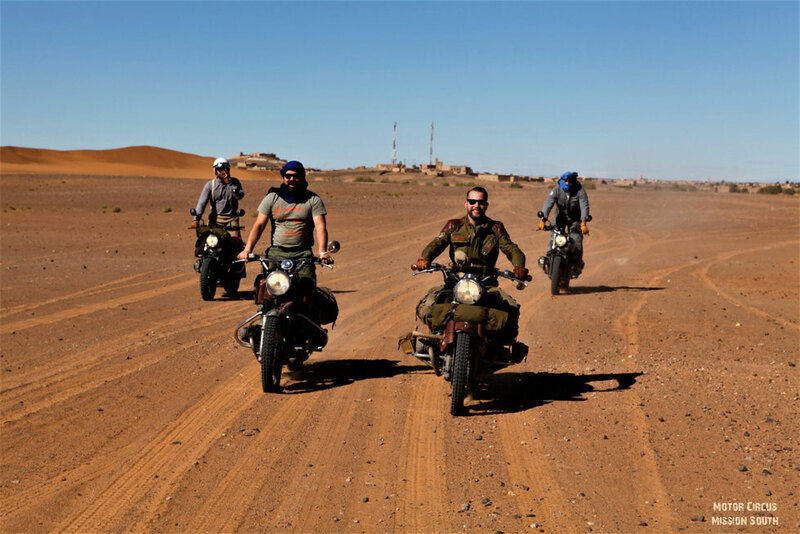 Result : a wide grin on our faces, sand in the most unsuitable places and two lost rear view mirrors on Martin's scrambler. Oh well. As it began to set, the sun turned the golden sand red, we patted our sand blasted motor bikes and looked happily at the sinking sun. 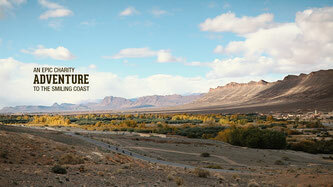 Expansive landscapes stretched out before us in the coming days on our way south west to the Atlantic coast. 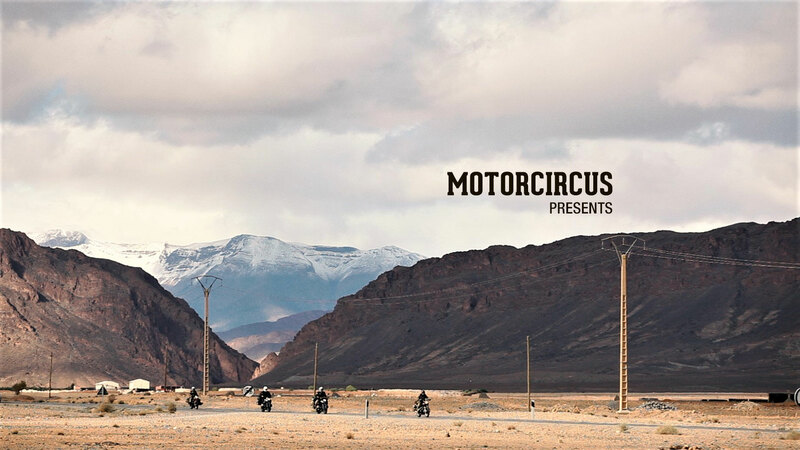 Oases and mountains were the backdrop, as the rough Moroccan asphalt provided a secure grip for our tyres. To catch up on time lost, we cracked on, putting a lot of kilometers behind us. Stages between 400 and 650 kms followed ,including riding by night. Night journeys in Africa are generally not recommended. In the twilight, insects are a plague, the riders and the headlights don't pick out the potholes in the road, and vehicles without lights are clearly more difficult to spot. Donkey carts and pedestrians also use these few roads at all times of the day and night. As we traveled the number of checkpoints increased substantially. 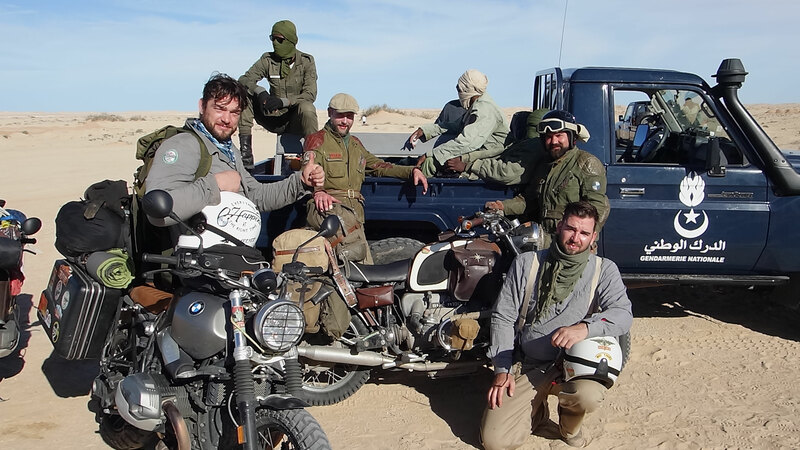 The Moroccan officials in the West Sahara always knew exactly where we were. A short stop before and after each village became normal. We gave our details to the always friendly officials, We had a decent little chat and then revved our engines and were off, and quickly back up to our cruising speed. 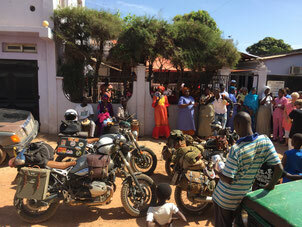 Subsequent border crossings into Mauritania and Senegal were also of a typically relaxed African nature. It was all going smoothly, without any great excitement. We generally didn't have to open our bags. And if someone did want to look through what we had with us, then we told him about our adventures and our dirty underwear in the bags. With that, the subject was usually reliably brought to an end and the loaded AK 47 disarmed. Good journey. Inshallah. We thank them, smile, and accelerate away. 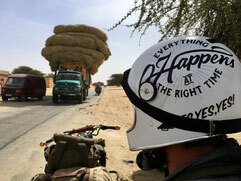 Now in the bare, parched landscape of Mauritania there is not a single tree to be found. No shadow provides relief from the burning sun. Here the poverty is noticeably more severe than in the Magreb to the north. But nevertheless people are friendly and ready to help. The roads though, along which one has to ride as if through a slalom course, make for a kind of pot-hole bingo. Whoever isn‘t really concentrating here, will find himself and his bike in a large asphalt and sand pit, and with it the end of his journey. And who would fancy having to hang around here with an open bone fracture or a broken wheel fork? So take your time, pour some waterover your head and then eat more dust. Occasionally camels or overturned and overburdened lorries block the roads, and warthogs career past as if being chased by big cats. In the evenings, by the way, the land is just as dry as during the day. The sea to our right, sand to our left, but our goal lies in the south. The bikes are running well, unimpressed by the heat. Man, are we proud of our bikes! The old ones, just like the new ones, breathing in dust and burning kilometer after kilometer on poor quality petrol - in so far as we can get any. How does a bike on low octane fuel sound? Not pretty. The valves sing a song of terrible suffering.. Bikes tipping over and getting stuck in the sand also happened, of course. Thorsten, on the heavily laden camera bike, tended to get the worst of it. The evening round of drinks was often on him. The number of boabab trees and green in the landscape is increasing all the time now. 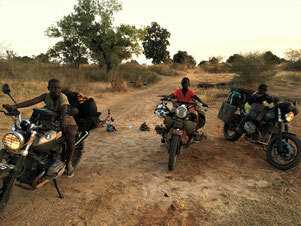 We reach the Senegalese border in the dusk just before the end of the day. The border guards are friendly and somehow everything seems more colorful and happier. After St. Louis, well known for good jazz, decaying French colonial buildings, and a huge amount of rubbish in the lagoon, we press on through the savanna land to Gambia. The day before the last west African dictator Jammeh had been voted out in an election. An internment camp for witches and the healing of HIV by laying on of hands were typical policies of his leadership. The people at the side of the road wave and smile. We wave back, pleased. The three boys at the watering hole can hardly believe it. Chris puts the peanuts they've gathered to one side and then lifts them onto our bikes and so gives them a little diversion from their usual daily routine. What they don't realize is that for us, too, such moments are of great joy. The joy only lasts a moment though as the self appointed king, Jammeh, doesn't want to give up his throne. The Millitary are taking up their positions. Are they prepared to fight? In our last stage, nature shows us once again the unique beauty of Africa. Wild hippopotamuses and chimpanzees grant us for a moment a look into their threatened world. With a failing alternator on our BrownSugar we journey the last 300 km in formation and towards the setting sun. 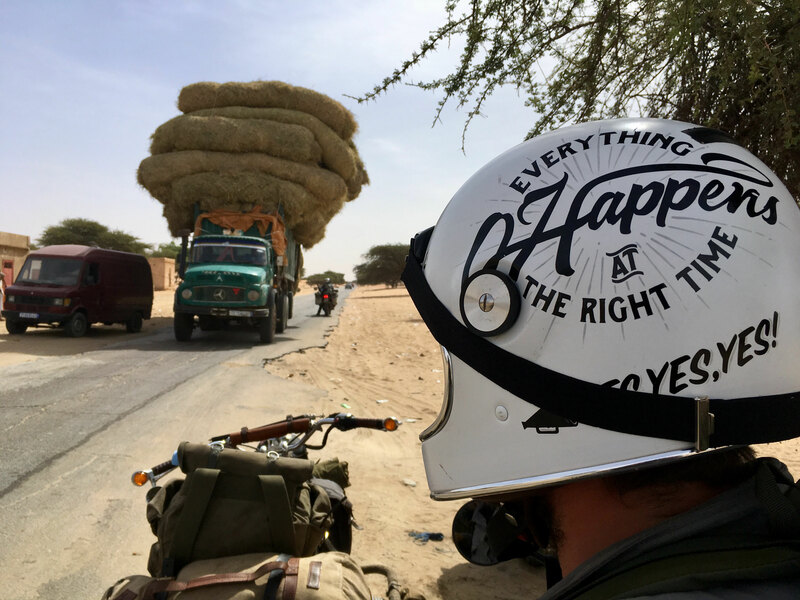 We get through the the last of the military checkpoints and reach, feeling blessed, our goal, our little clinic on the Smiling Coast of Africa. Eight years ago, we founded with friends a charity named „Ärzte Helfen e.V.“ (Doctors are helping). 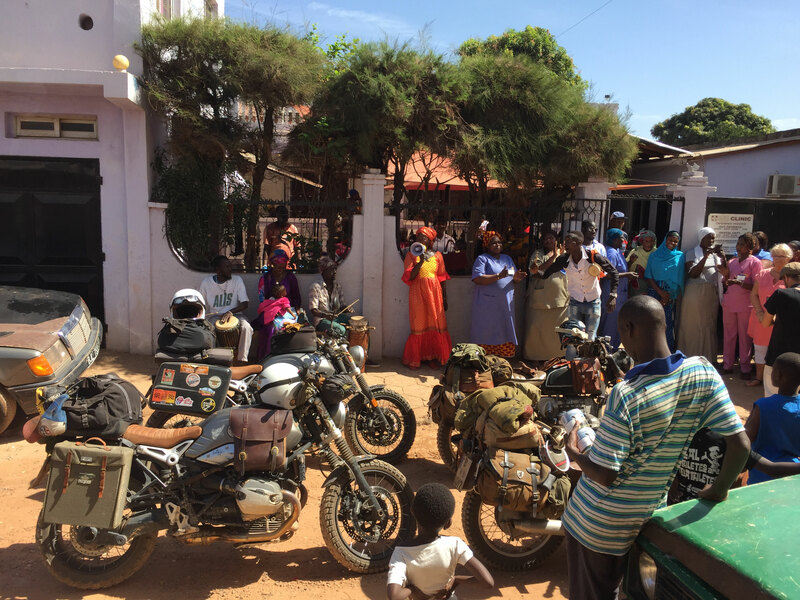 Since then, every year, some of us travel to work voluntarily in the Gambia, repairing medical equipment, organizing doctors and medicines in our Partner clinic, and financing and paying for many treatments and operations in Africa's smallest country. Here joy and sorrow rub shoulders every day. When one sees children who for months have to live with a shin bone fracture, a facial tumor or toothache, without receiving any treatment, then one starts to ask oneself why and how this should be. You could leave finding answers to others or you can start to make a small contribution yourself , to create a little more justice. In this way, the world is made a little bit more beautiful in times in which it's beginning to become more hateful. 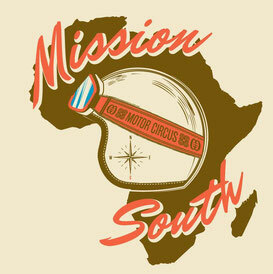 Our Mission South led us towards the south. For the people in the south, their mission, their roads, often lead to the north. We were not met with hostility. We were not robbed. We did not become victims of violence. We were met with open arms and a smile. Everywhere. As the final ultimatum ran out, the last west african dictator went into exile. No blood needed to be spilt and the people celebrated. GAMBIA HAS DECIDED. The land now has the chance of greater justice. We shall see. But first let`s see if our beloved bikes survive their sea journey back to Hamburg. Inshallah. 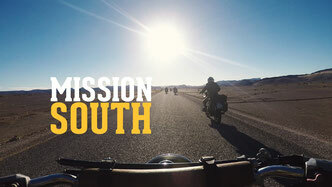 We would like to thank all those who have supported MissionSouth. Together we have raised 12,000 euros in donations. These funds will be used in Gambia for effective, sustainable medical care. Dank Euch konnten wir insgesamt 13.000 € Spenden sammeln, welche unserem Projekt in Gambia und den dort lebenden Menschen Zugute kommt. Danke!